This machine is designed for digging trenches in normal ground of reasonably soft dirt and stones up to 6 inch diameter. Ground with larger stones, high clay content, very hard packed, very dry, or in a frozen condition may be unsuitable for normal trenching. Consider using a backhoe or other heavier equipment for such conditions. 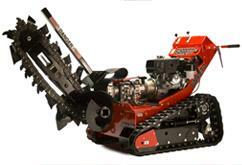 Trench Depth - up to 30"
* Please call us with any questions you may have about our trencher 30 inch rentals in Petoskey, Northern Michigan & The Upper Peninsula.